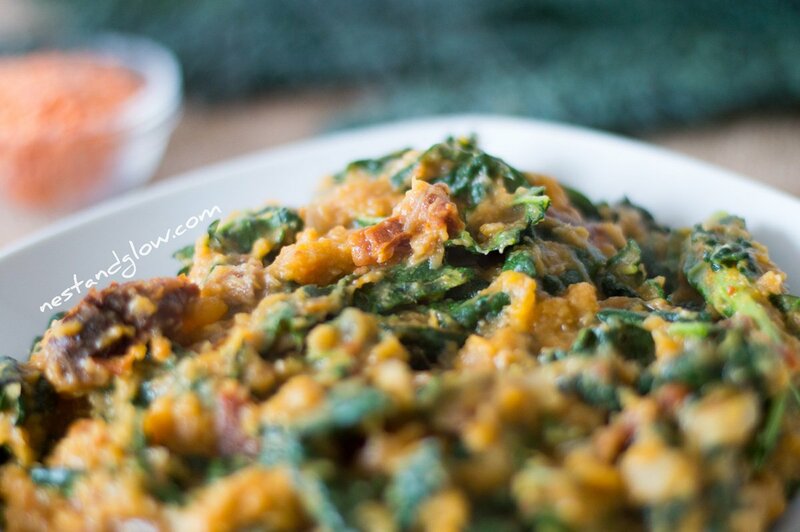 Kale and sweet potato dahl a great cheap, quick and tasty dish that will warm you up on a winters day. I make in a pressure cooker (or InstantPot) so that it cooks a few minutes but it can be made in a normal pan. A portion of this brightens up a grey cold day and contains over 3 portions of your recommended 10 a day. Leafy greens are one of the most nutrient-dense foods. I try to have some every day as they are loaded with so many vitamins and minerals. Kale works great in this but all leafy greens are amazing for you so feel free to change to spinach, Collard Greens, cabbage or bok choy. I use sun-dried tomatoes in this dish as I always have them on hand and most tomatoes in the UK are pretty tasteless and the odd time I buy some expensive ones I feel its a shame to cook them. I use sundried tomatoes that are totally dry and not in oil or anything. If you use fresh tomatoes then you may want to add some salt as sundried tomatoes are cured in salt so usually I don’t add any extra salt. In place of tomatoes, red peppers are also good. I often double the amount of cayenne pepper and turmeric in the ingredients to make it hot and full of nutritious spices. Turmeric has many health benefits that are not fully understood so I often add a pinch or five into most savoury dishes. Buy your spices in bulk from an Asian supermarket and they will be a fraction of the cost and you save on wasteful packaging and transportation. This is a great healthy lunch box dish, just make sure to use airtight containers. Also, it’s good frozen where it will last for 3 or so months. For some reason, this dish often tastes better as leftovers heated up. Maybe the spices blend and mature when left for longer to mingle? Coconut butter is totally optional in this recipe but I like to add a bit at the end as a bit of fat enhances the taste and I like adding raw healthy fats rather than cooking with oil or fats. The coconut butter also adds a delicious coconut fragrance to the dish while not adding many calories per serving. 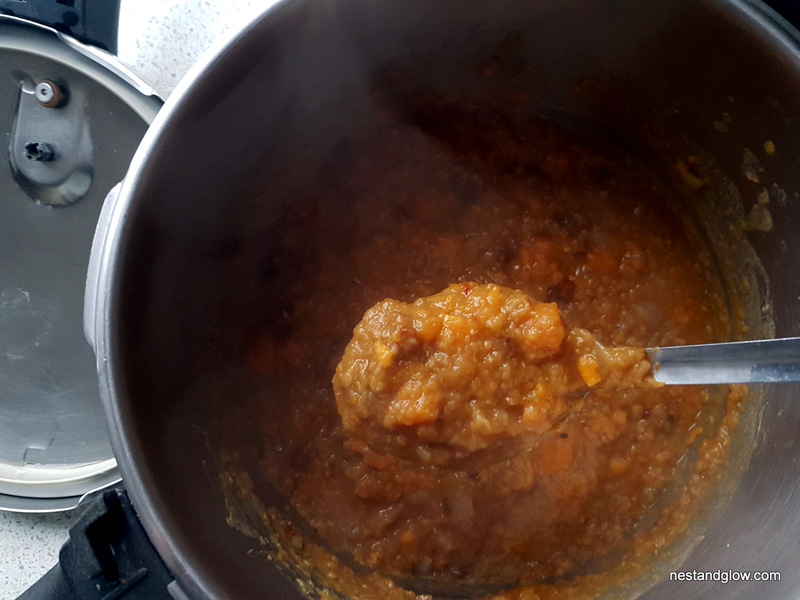 See my recipe for coconut butter to make your own just by blending desiccated coconut. Add everything apart from the kale into a pan. Either use a pressure cooker and bring to pressure then cook at high/setting 2 for 4 minutes. Then remove from heat and wait for the pressure to go down. Or use a pan, cover and cook for 20-25 mins until the lentils are tender. 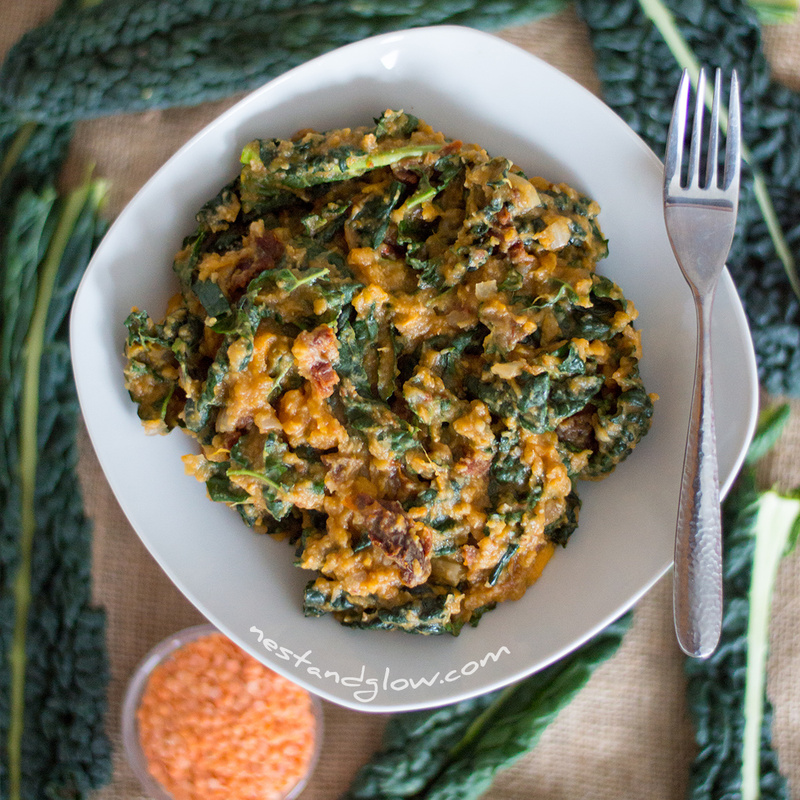 Take the lid off the cooked dhal, stir in the chopped kale and coconut butter. Let the residual heat wilt and melt them. Enjoy straight away. Keep any leftovers in an airtight container in the fridge where they will last a few days. This looks absolutely delicious and I’d love to make it next week but the recipe doesn’t list any liquid as an ingredient. Is the 1l of black pepper a typo that should read water or vegetable stock? I want to make sure I get it right. Absolutely fantastic! So delicious and very easy to make. It’s tasty on green pea pasta or chickpea pasta! Also, for anyone who’s thinking of omitting the coconut oil – I’d recommend leaving it in. You increase your absorption of beta carotene from the sweet potatoes with the added oil. Can you make this on the stove as well? I’m not sure I quite understand, this is made on the stove I thought? Hi Bastion, thanks for the recipe. You say that you buy sun dried tomatoes without oil above. Please can you tell me where you source these as I have only ever seen them sold with oil in jars? Hi there, have you tried health food shops? I buy mine in bulk from suma.coop or from my local health food shop. This…is…seriously… THE…BOMB….. Oh my goodness. i have made it 2 days in a row and all my fussy 5 loved it. I seriously love you. can you come and live with me. OH mY GoodnEss!!! This is the BOMB. My fussy 5 loved it so total WIN WIN. Can you come live with me. Hello! Is the calorie count per serving or for the entire dish?